When my eyes first caught a glimpse of the photographers book NLXL by Karel Tomeï, I was deeply impressed by these familiar yet indistinct patterns in the landscape as seen from the air. Drastic changes in perspective become apparent only when you observe the views of Holland from the sky. The photos made me wonder: “What would it be to convert NLXL into a mixture of music and soundscapes?” After I contacted Karel Tomeï on the idea, I started reorganizing the photos into categories. A multitrack recording comprising a variety of keyboard instruments, that was the idea. We are a land of water. In the early days, the Low Countries were largely submerged. People in the Netherlands have been draining the lower parts of Holland, and with that started a fight against the vast waters surrounding us. Dikes along with a multitude of mill pumps keep the water away from countryside and urban areas. This story becomes clear when you look at photos taken from above. An equal rendition can be heard in the accompanying musical composition. Strange agricultural formations perfectly combine with an amalgamation of the shrill sounds of seagulls rising from the dunes and the clear notes of alternating keyboard instruments playing throughout. The composition is written in predominantly A minor. The threat of water remains, as the larger part of Holland resides below sea level even now. The NLXL composition about Holland (the word itself composed of seven letters), is composed primarily of seven distinct notes of the scales. As notes follow in ascending order they create the impression of audibly taking to the air, whereas dropping lines of notes represent looking down at the world below. When you do look down, you'll notice how whole our country is a configuration of individual jigsaw pieces fitting together neatly. This notion is also the blueprint used to compose the music. Large segments versus the smaller parts of landscape express themselves in longer and shorter notes. As landscape ingredients repeat themselves to form the jigsaw, so do an array of motifs produce a similar fitting jigsaw for the ears. Vegetational dispersion found in photographs of nature come forward in music in the form of variations of these motifs. What makes this composition unique is the extraordinarily relation between photographs and music. Instead of just looking at the numerous sea shores, you can hear them too. But not just soundscape recordings are reflections of the photographs, also the keyboards share this relation. The continuous refinement of the roads into streets and eventual paths can be heard back in an unceasing advancement of detail in the motifs. In addition, a symbolic value can be found in each of the instruments: the striking red toy piano is a characterization of a country midst a range of other countries much larger than itself. It is first to play the NLXL theme, thereby revealing his identity to his larger counterparts. One of the latter is an organ: organ sounds are a reflection on the high organ density found in inner Holland. Harpsichords symbolize old music tradition, as opposed to synthesizers, who represent a completely different, modern culture. The NLXL composition includes a soundscape. A soundscape is a collage of sound recordings from a particular location. A collage it is indeed: recordings are categorically scattered throughout the musical piece. The location in this respect is rather extensive: the Netherlands as a whole. I have been to countless spots to record the diversity of sounds. One time, when I thought I had found the ultimate site of quietness, I was holding the tape recorder, and noticed how still there was this vast arrangement of sounds middle in the fields and flowers. An exciting moment was this time I stood beneath a bridge and heard the traffic flow of the A10 create an intense low-frequent tone. At the same time, a railway train passed and a subway passed underneath me. It was a moment of such vigor, I decided to use this recording as a transition between two sections. The NLXL theme is transcribed a-c / e-c. This motif, along with the organ and the opening motif a-c-a-c-b-e are like a “leitmotif” throughout the entire composition. The score counts 232 pages. Inspired by the performance of Different Trains by Steve Reich, we play on an acoustic piano, three keyboards, two toy pianos and percussion, all lead by a master tape. To play all the instruments of the piece acoustically, without use of tapes, it would take 12 musicians. Enjoy listening to a finely tuned mixture of music and soundscapes and get taken away to the skies! Karel Tomei (1941) is an award-winning photographer, who specializes in aerial photography. His work has taken him far and wide on varying assignments from Africa, to Japan and Russia. In 1988 he won the prestigious Kodak Industrial Award and two years later was presented with an award by King Gustav of Sweden for artistic photography of the landscape and the environment. His work has been featured in many publications. In 2009 Karel Tomeï was knighted for his entire oeuvre. Large format and super thick book with 350 artistic aerial photographs of the Netherlands, interspersed with text contributions from sixteen famous Dutch celebrities. The photos show the Netherlands as a rigidly organized, manicured country where even the breakers' yards seem neat and tidy. Ditches, roads, dikes and lakes form the contours of the photo compositions, in which man also plays a role. The photographs are pinpoint sharp, with a strong color construction. The photos are, without exception, remarkable and are captured in a clear, logical layout. Captions are handily arranged at the back of the book in rows of photo blocks. This book, weighing 4.3 kilograms, is a masterpiece by the photographer and a wonderful attention getter. NLXL uses stills from Karel’s book NL XL - a rare perspective on the Dutch landscape of over 350 stunning aerial photographs. 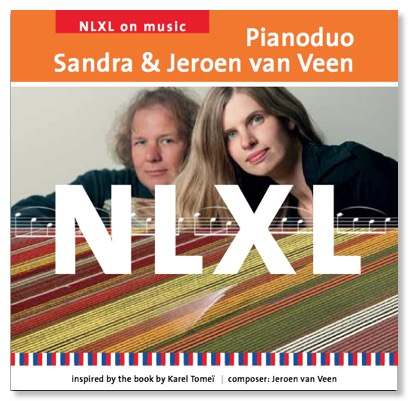 Sandra Mol (1968) and Jeroen van Veen (1969) met at the conservatory in Utrecht in 1987. Since then they play together sharing their passion for multiple piano music. Their first Cd was a live recording presenting Canto Ostinato for two pianos by the Dutch “minimalist” Simeon ten Holt. This Cd was sold in more than 40 countries worldwide. Concerts and recitals brought Sandra & Jeroen from Miami to Novosibirsk. They are initiators of many concert series, among them the Amsterdam Concertgebouw and the Lek Art Festival in Culemborg. They recorded over 40 Cds in the last ten years. Besides playing piano they teach, adjudicate, compose music, and produce many different concert programs on a variety of common and uncommon concert locations such as railway stations.